Before you begin Never Let You Go, you must read Never Tear Us Apart first since this book is the final conclusion to the story of Ethan/Will and Katie’s story. I never thought I could be addicted to a love story that was so consuming, poignant, heartbreaking, and utterly raw till I read the forbidden love of Ethan/Will and Katie. Monica Murphy wrote not just an ordinary love story but she wrote a love story that strips you naked and leaves you feeling raw, vulnerable and exposed. This love story didn’t begin like any typical romance where boy meets girl and falls in love. No this is a story where two young individuals met because of a monster. A monster that will tie and bond the lives of Will and Katie in such a profound way. It is a story that is gritty, raw, and poignant. It is a story of devastation. A story where life and innocence is stolen. Ripped away. A story where a victim/survivor faces her past, fears, and the unknown of what lies ahead of her. A story where an unlikely hero is her salvation. A story where the hero doesn't feel like a hero. A story of conflict. A story where right and wrong is blurred. A story where two lives intersect. Two souls mingling. Two hearts beating as one. A connection made. A story where light is overshadowed by remnants of darkness. And most importantly a story of love, redemption and second chances. In this utterly devastatingly beautiful tale of innocence, loss, sadness, redemption, hope and second chances, Monica Murphy continues to douse her readers with an onslaught of emotions. Ms. Murphy leaves no stone unturned as holds you hostage as readers awaits what will happen to the story of Ethan/Will and Katie. As Katie learns of the truth of who really Ethan is, she is devastated that man she longed and cared for is the same person. Her Will. They say the truth will set you free but in the case for Katie, the truth hurts. How can you fall in love with the son of the man who abducted, raped and abused you? Katie is well aware of what her family thinks of her relationship with Will. As much as she tries to stay away and forget Will, a part of her needs him in her life. He is embedded in her heart, soul and mind in more ways than one. And for Will/Ethan, Katie has always been the one. The one girl who stole his heart. The one he loves and wishes to protect. How can two broken people love? The answer is simple….their love heals. In the eyes of the public, we can easily judge and say that their relationship is wrong but if you really look deep down their love is just as meaningful as to any two people falling in love. Never Let You Go is a story that consumes you right from the start. It allows you to really SEE in the eyes of Katie and Will of what their love means to them. Their love is like air. They need each other in order to survive and have purpose. Their love is healing because together they know what it means to truly live in hell and survive. And most importantly their love is hope. Hope that new beginnings is awaiting for them in the horizons. While a big portion of this book is the inner struggle and emotional bond of Katie and Will trying to define their relationship, Monica Murphy adds layers of grittiness and conflict to the story as she integrates factors of the public, media, and Aaron Monroe into the storyline. So can Will and Katie find a way to make their relationship work and never let each other go? Or will their past define them and tear them apart? 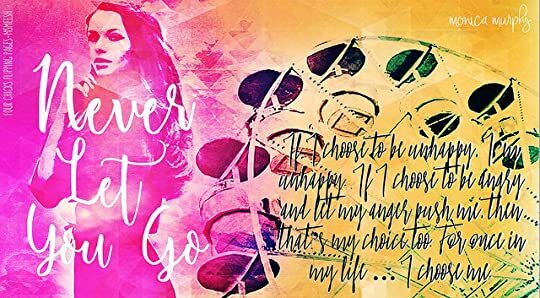 Never Let You Go is an unforgettable story that will make you FEEL the heartbreak, the conflict, the loss, the devastation, the love and hope that binds Katie and Will. It is a story where you are hypnotized by Monica Murphy's delicate and raw prose. The writing was phenomenal as Ms. Murphy strips her readers naked as she exposes the vulnerable nature of Katie and Ethan/Will. She allows readers to be given a glimpse of what it truly means to have your heart and life exposed for the public to scrutinize. The love that Katie and Will have for one another cannot just be summed up or explained with just words. This bond that they have must be felt. And so Monica Murphy allows her readers to really FEEL for Katie and Will and not judge them for this intense connection and tangible bond they have for one another. Their relationship may be looked down upon but who are we to judge and deny love. So if you are looking for a book that will steal your heart, hold you hostage and leave you with a sense of hope, peace, love and second chances, then I highly recommend you to read Never Let You Go.